20% – Businesses that saw an increase in sales after bicycle lanes were installed. 70% – Businesses that saw a “positive impact” on the surrounding area after bicycle lanes were installed. 66% – BikeShare users who used BikeShare to make a purchase. 23% – BikeShare users who said they spent more money because of their trip. Source: Benchmarking Report, Alliance for Biking and Walking, 2016 as reported in BICYCLE TIMES, Jun 2016. 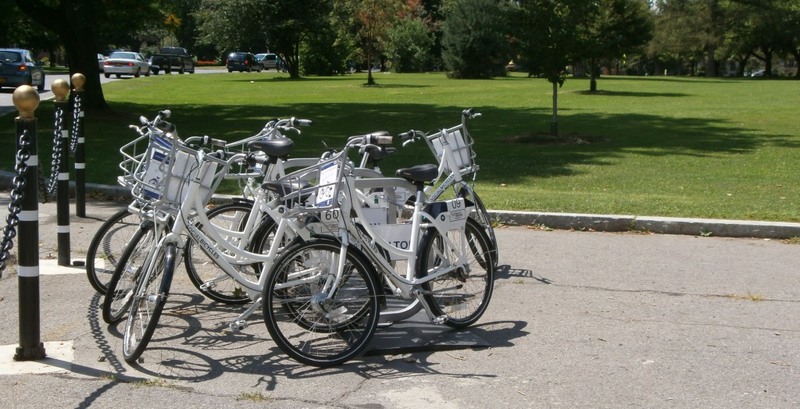 BikeShare came to Albany August 9 – 16 giving Albanians a chance to test both the concept of BikeShare using a “social bicycle” system and the bicycles themselves. The indomitable Tim O’Brien of the Times Union reported tentative results of the BikeShare test in the Times Union on August 19. Notably, a common thread of those quoted in the article is the need for meaningful bicycle infrastructure (read: “protected bicycle lanes,” “buffered bicycle lanes,” and “bicycle lanes”) as a precondition for getting people on bicycles on the road and cars off. Absent this realignment in road design priorities by the cities, people who fear braving traffic will continue to do so and BikeShare will remain a novelty. Friday, August 15, seemed like a great time for a “road test.” The starting point was at the sign-in table in Tricentennial Park (Broadway and Columbia St.). While the registration process was slow, in a real, live system this would be a one-time task. As with this test, one could have registered in advance at http://capitalmoves.org/albany-bikeshare-week/. However, meeting with the BikeShare attendants, Nnenna and Dakota, was more fun and provided a chance to ask questions (and get my Brompton’s soft tyres filled – much to my embarrassment). After providing everything but my maternal grandmother’s maiden name, I was assigned a 6-digit login code and a 4-digit PIN of my choice. The helpful attendant gave me a quick orientation on the bicycle and guided me through the sign out process using the key pad on the rear of the bicycle (see photo). After a quick brake check and seat adjustment, it was off down Broadway feeling like the “king of the road” on my very upright SOBI. My first ride was 1.4 miles (and 25 minutes) from Tricentennial Park, past the Times Union Center, up the hill toward the ESP and then on to Eagle Street and a photo op –appropriately in front of City Hall. Even with a severe respiratory issue, the smooth shifting, well-geared bicycle let me make the trip without issue. Feeling rather proud to be part of some grand experiment, I went down Pine to Lodge and then again did the “king of the road” thing down State St. with all the lunch-time crowd looking with (I imagine) admiration and envy. After returning my BikeShare ride to Tricentennial Park, I hopped back on my Brompton and headed to Washington Park/Lark to try some more SOBIs. 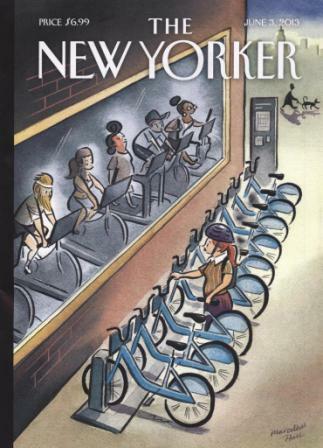 Since these are “social bicycles,” there are no docking stations as in some of the larger, established systems. One locks up or unlocks from a conventional bicycle rack (which, if not plentiful, are scattered around the city). At the Washington Park rack, I selected a new ride from the covey of idle bicycles and took a short cruise to the Downtube Bicycle Works for a courtesy weigh in (45# 14 oz) and then to “Lil’ Buddha” for lunch. (Notably, even the SOBI’s cushy tires and seat could not absorb the joint-jarring, nonsensical bricks on Lark). Glitch #2 – As I approached the bike stand it dawned on me that the info card with the secret login code was with my Brompton and not me. After retrieving the needed number, I tried to check out another ride only to have the readout say “Move bike ~ No connection.” Duh. Selecting another bicycle, I headed for a relaxing jaunt on Central Ave., circled around Quail and Washington, and then rode back to a bike rack on Lark. My “glitches” really weren’t as they would be resolved with better operator preparedness. The SOBI is comfortable with an impressive upright position. The Shimano “Nexus” 3-speed hub shift works very smoothly with no need to ease up on the pedals to allow shifts. The shifter is opposite from a normal 3-speed or derailleur in that one twists down for a higher gear. 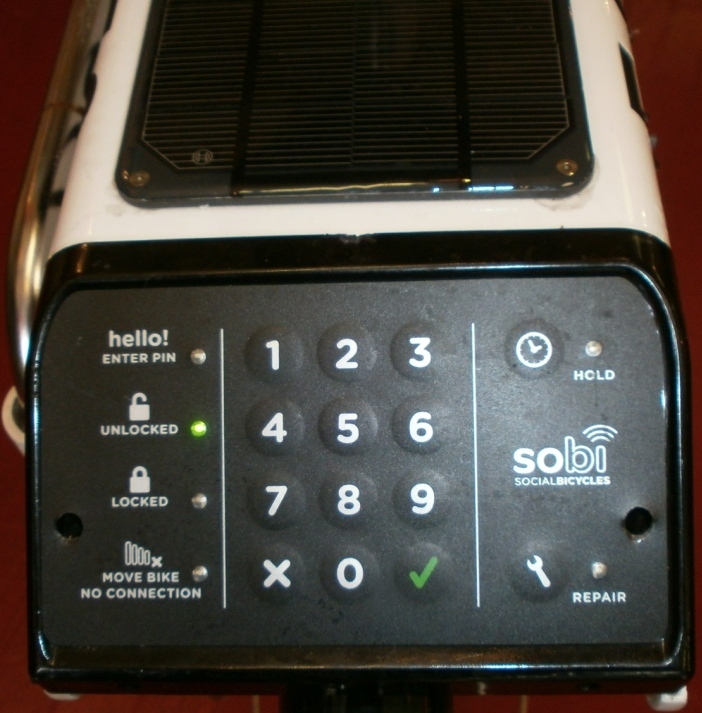 The SOBI has a smooth, functional design. Nothing appears tacked on as an afterthought. There are few if any snag points for clothes or gear. The shaft drive makes an unfamiliar but pleasant noise (to which one rapidly grows accustomed), but this is more than offset by the cleanliness (no greasy paint legs) and durability of the enclosed drive. As the dynamo-powered lights go “on” automatically in the dark, no assessment was possible. The rear “rack” isn’t. The rear assembly is for the electronics, tail light, and U lock and not for gear or groceries. Plan on a messenger bag or the like. But try to find the bell! 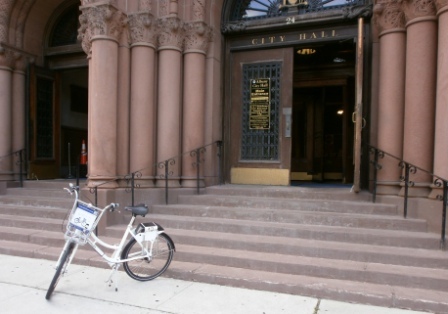 Overall, I was pleased that Capital District Transportation Committee, the City of Albany, and Buffalo BikeShare – supported by PAL and Albany Bike Rescue (helmets) – conducted this study. It was exciting chance to test out both the equipment and the checkout/check in procedure. From start to finish, everything worked about as one would expect. 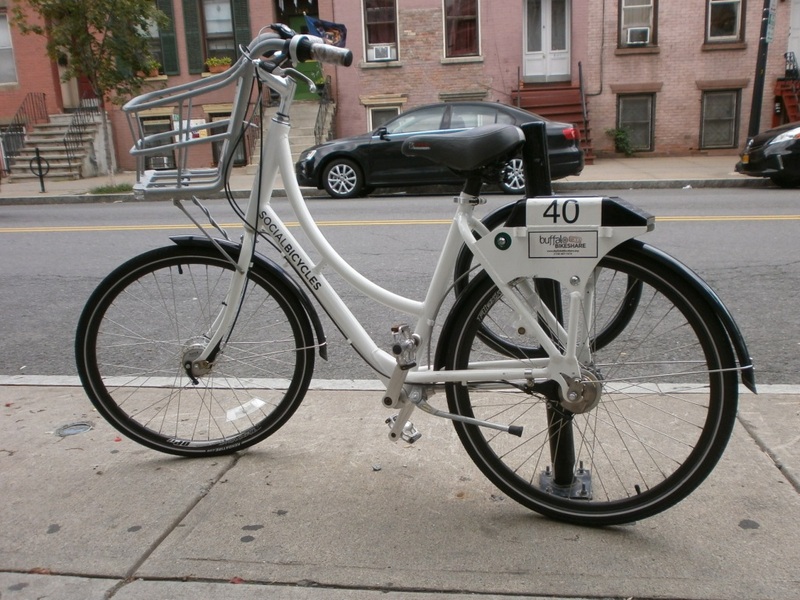 The “social sign- in/sign-out” feature was attractive as it eliminates the need to hunt for a docking station with a vacant spot, avoids the type of docking issues that still plague New York City’s CitiBike system (reported as recently as 727/14, New York Times), and provides convenience for those riding to hub-starved areas. 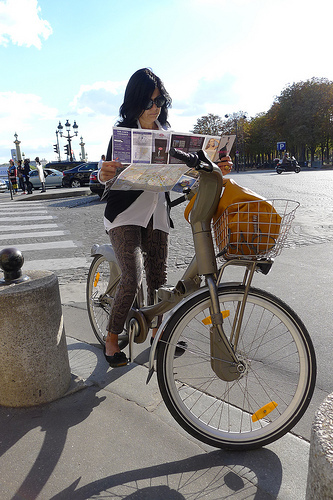 The downsides are the need for a “smart” phone or notepad to locate the nearest non-hub bicycle and the administrative headache of having to identify and retrieve SOBIs from out-of-the-way drop points. As an added bonus, Albany’s BikeShare experiment was extended an extra day so a group of the Daily Grind riders could stop in at the Washington Park hub for a try out. If you did you own BikeShare assessment, please add your comments to this post. 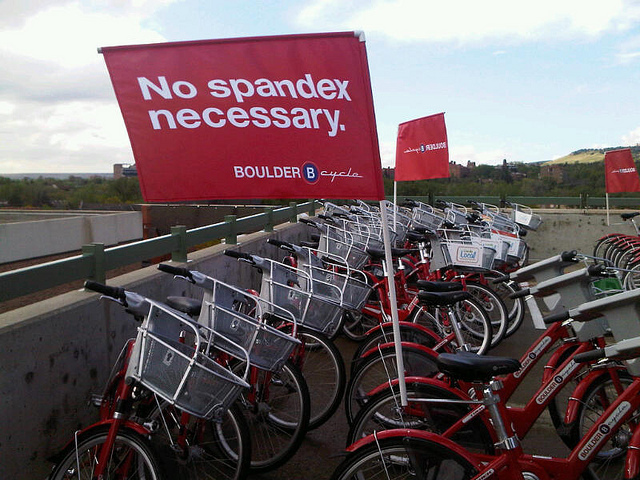 Please also remember to complete the “Capital Moves” BikeShare survey. PHOTOS: Hub at Tricentennial Park, Keypad, SOBI at City Hall, Lil’ Buddha, Hub at Washington Park, Hub on Lark, and Happy Rider. 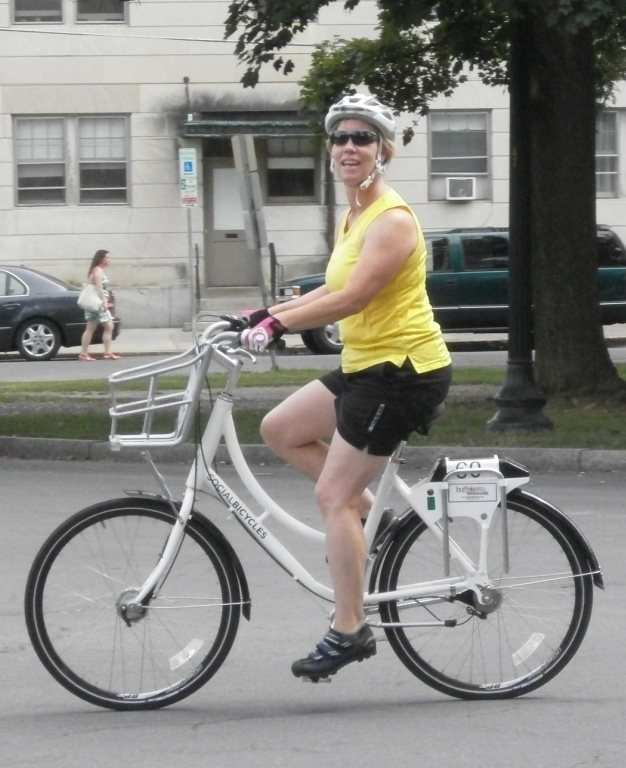 On June 20, 2014, the Capital District Transportation Committee announced its CAPITAL REGION BIKESHARE MONTH. 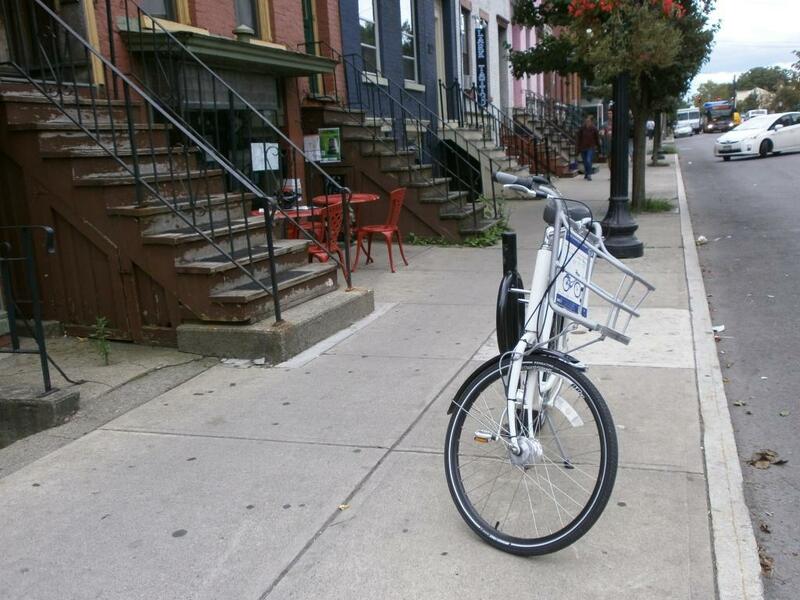 This will include short-term BikeShare pilots in Albany, Saratoga Springs, Schenectady, and Troy. There will be 25 bicycles for use between 10 am and 8 pm at one or more locations announced by the cities. The Albany BikeShare will be in Washington Park in Albany from Saturday, August 9 through Friday, August 15. There is no cost to participants, although a credit card will need to be on file as security for the bikes. More information and updates will be available here. Other City Dates were/are as follows: Schenectady Thursday July 10 – Wednesday July 16, TroySunday July 20 – Saturday July 26, and Saratoga Springs Wednesday July 30 – Tuesday August 5. 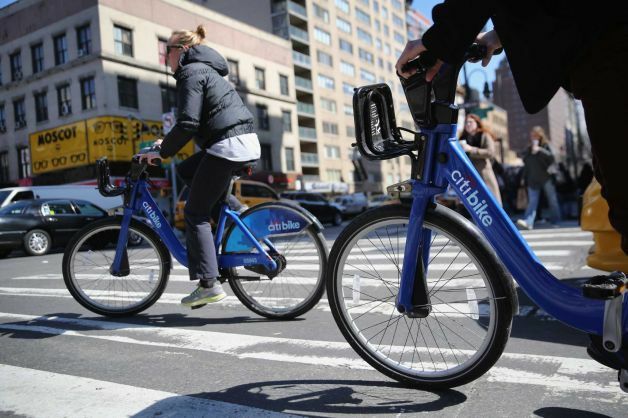 The signature program in New York State is CitiBike. Here are some statistics on NYC followed by global data. Carbon Offset – 5,832,377 lbs.